Learn the Science and Art of Henna: Hands On! 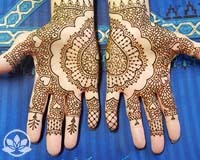 Learn mehndi, the art of henna, with hands-on professionally taught classes in Orlando, Florida. These are structured classes packed with hands-on education and experience. If the date is not listed below, we do not have a date yet. Click above picture for details. Advance dates are tentative and subject to change. without the need for a picture. Purchase any two classes, get $10 off. Purchase all three classes and get $20 off! All classes must have 5 students, or class will be canceled. If class is canceled, 10 days notice will be provided and full refunds issued. Registration for workshops closes at 10:00am two days BEFORE the workshop. 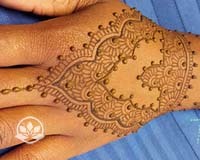 Approximately, three times a year we offer a henna learning opportunity with our extension classes. 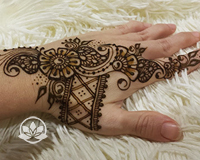 The Simply Henna 101 workshop is offered followed by topic-based henna Labs. These are limited and tend to sell out, particularly the 101 class, so purchase your ticket early. We occasional bring in a major henna guest teacher from the professional henna community for an intensive hands-on classes and workshops. These can be one day or multi-day events based on the availability of the instructor. 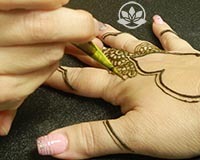 Our henna workshops and classes are offered once a quarter. 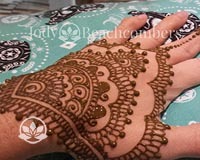 The Simply Henna 101 workshop is offered twice a year. The 101 class is followed by one or two subject based henna labs. 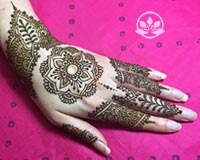 Labs can be taken on their own or in conjunction with the 101 henna class. This workshop is offered 2 times a year and tends to sell out. It is announced approximately 30 days in advance, so buy your ticket as soon as it's available. Learn how to do henna with an in-depth introduction to the basics of henna tattoos. Learning the science and the art of henna gives you everything you need to start or continue your henna adventure! Includes THREE hours of professional instruction, a workbook, workshop materials, companion eBook, and a complete henna take-home kit. 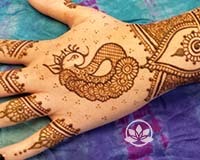 This is a full 3 hour workshop with 2 hours of hands-on henna work. The workshop is bargain priced, as it includes a henna kit with more than $30 worth of product and a free companion eBook. This is over a $40 value! Our henna labs are subject based classes. We offer one or two labs after every Simply Henna 101 workshop. Below is a list of some of our labs. We are continually creating new curriculums and subjects. Each lab is updated every time it's offered so all labs remain current. Labs vary in time between 1 hour and 2.5 hours. Prices vary based on time and product used but are normally around $30-40. Basic henna information is NOT taught in henna labs. If you are a beginner, you should take the Simply Henna 101 workshop first. The Gross Anatomy of henna! 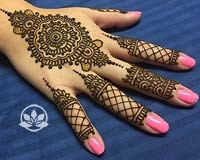 Learn the principles of henna design fundamentals to create designs that are professional quality. These design principles relate to every style of henna, will enhance your understanding of bringing a full henna design to life and build a foundation for strong henna stylization. These are the principles that allow you to develop your own henna style as an individual artist. This is a natural follow-up of the Anatomy 1 Lab. It contains guided layout practice where we re-create complete designs start to finish. After learning the principles of henna anatomy, this class helps to cement the concepts giving you go-to designs that you are comfortable doing. This creates a strong foundation for finding your henna voice. Learn to utilized fillers in different ways, including how and when to use filler techniques. Tips and tricks to create neat and clean looking fillers in both traditional and modern henna designs. This is a great workshop to take if you are interested in bridal style henna. Fillers feature heavily in bridal henna. This class focuses on how to use negative space within a henna design. This is arguably the most important part of henna anatomy and the most difficult to master. You will learn to use negative space in creative ways and to consider the use of negative space in every henna tattoo you do. This lab focuses on expanding your henna vocabulary. This is a great workshop to take if you are interested in bridal style henna. The class teaches various ways to create texture in henna, including different was to add shading to henna designs. We physically practice techniques and explore unique wasy to add depth and texture to a henna design. In this hands-on technique class, you will learn to lay down the perfect henna line. Learn how to drape henna and how to draw henna. We will drill, drill, drill and you will be prepared for you own at home henna practice. 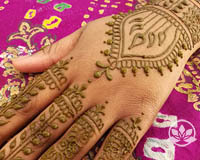 Learn the basics of both traditional Indian style henna and modern Indian style henna. You will learn foundation layouts, how to combine elements, and how to create full hand designs. 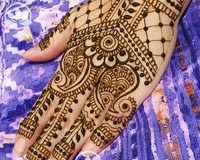 Learn the basics of both traditional Indian style henna and traditional Arabic style henna. 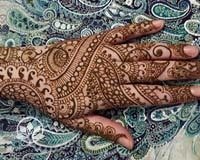 Learn to identify the differences between the styles and how to fuse them for unique henna designs. Learn the basics of both traditional Moroccan style henna and traditional Mauritanian style henna. Learn to identify the differences between the styles and create a foundation ofr incorporating both styles into your henna work. This class will teach how to build sangeet strips for quick party designs that people love. Learn techniques to create individual henna designs for each person while still being quick. Perfect for beginners but also great for anyone that wants to do henna on others at festivals or parties. If you want to do henna on others for money, THIS is the class for YOU! Avoid common mistake new henna artists make at early henna gigs. Learn what you need to prepare for a gig, how to price henna, contract basics, and so much more. This is a business class not a design class. This class is designed for you to make money doing henna and to start your henna business off right. Learn multiple ways to create gorgeous symmetrical mandalas in henna. Learn the art of creating custom mandalas and placement. Great for festival artists and henna artists that do parties so you can add speed to creating mandalas. An in-depth look at our favorite henna motif; the peacock! Learn specific types of stand-alone peacocks and also how to incorporate peacocks into larger henna designs. 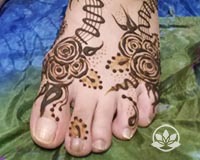 Learn the foundation to create henna designs for festivals and parties that are quick and look great. This is not about just duplicating designs, but learning to CREATE designs based on what's currently trending, while still being quick. 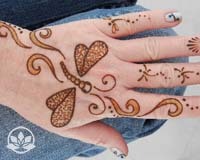 If you are doing henna at festivals or parties, this class will help you get through more people quicker and make more money. Master the skill of "Artists Choice"! Fun and quick henna designs! 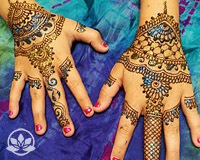 Learn to henna a selection of quick-high-impact party designs that people will love. This class does not cover the basics of Indian style. 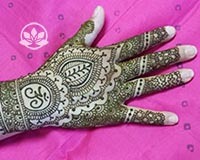 This is a step above basic Indian style into Indian bridal henna. We will cover, motifs, placement, tradition, and speed. This is very hands-on class where you will both duplicate and create designs. Though you can be a henna beginner to take this class, you should have some experience with henna. If you are not mixing your own henna paste from powder, or if you are not getting consistent results, this is the workshop for you! As in our Simply Henna 101 workshop the science of henna will be taught. 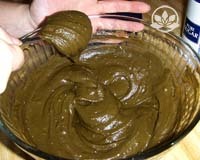 Learn dye release, ingredients for the perfect henna paste, and how to find the perfect texture. The difference is that instead of a demo, you will be actually mixing multiple batches of henna. 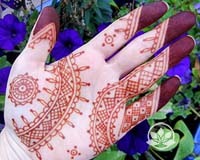 You will make and use different henna textures in class, along with take-home samples. This is an intensive 2.5 hour workshop and uses a ton of product.